Daemon Tools is a perfect tool which helps in virtual CD/DVD drive emulation. Through daemon tools, you can easily create virtual drives on your system and mount images without burning CD/DVD for instant access. In old times people used to make use of CDs/DVDs for data storage purpose. Well, it was really useful to have back up of your data, transferring them into image files in different many formats like NRG, MDS, CDI, CCD, ISO or BWT. Daemon Tools helps you to mount the files without need of any physical discs, creating the virtual devices that can help in CD/DVD emulation. This further helps to save your both time (no time required for burning the disc) and discs (resulting in less clutter). Daemon Tools work with different many available file formats which include MDS (Media Descriptor File), NR (Nero), B5T (Blind Write 5), CCD (Clone CD), CUE/BIN, ISZ, BWT (Blind Write), CDI (Disc juggler), PDI (Instant CD/DVD) and ISO. The Daemon Tools application is easy to use. It allows you to change settings and load disc image files quickly and effectively. You are allowed to create up to 4 virtual drives with Daemon Tools. You can easily upload the image files having different formats and enjoy their content without use of any physical disc. The great thing about this application is that it works with any CD/DVD drive and can load any type of image no matter whatever the protection is. For disc images, you can create any image file including MDX, ISO, MDF, MDS files and keep the content of CDs/DVDs or Blu-ray discs. To sum up, Daemon Tools is the perfect software solution that with its amazing advanced features will deal with all available image formats virtually. What are you waiting for? Just download Daemon Tools Lite and make the most of this amazing software. All-you-need from imaging software DAEMON Tools Lite 10 enables you to emulate up to 4 DT SCSI or HDD devices. With Quick Mount option you do not need to add virtual drives before mounting. Choose an image and DAEMON Tools Lite 10 will do the job for you. New virtual drive will be created in a moment so an appears to the system like a real disc. Looks pretty fast and easy doesnt it This is how DAEMON Tools Lite 10 works. 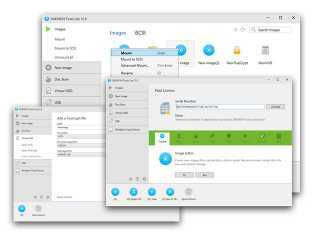 Smart tool to create organize and mount images Need to backup some discs Want to compress an image file to save space on the hard drive or protect sensitive data with a password With DAEMON Tools Lite 10 its as easy as pie. Both created and downloaded images are stored in the well-organized Images catalog and are always at hand. You dont need to add new images to your collection - just use Scan button to search for image files on the PC. 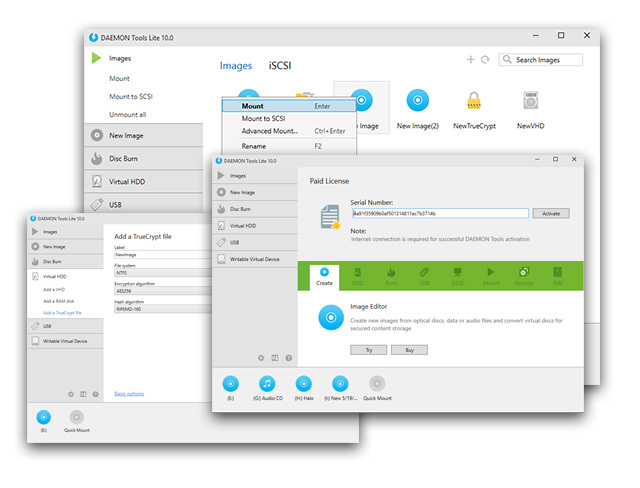 The most personal imaging software yet DAEMON Tools Lite offers 3 license options to choose the one that fits you. Get a Personal license for 3 PCs with Lifetime Updates and 247 support for a small price to use DAEMON Tools Lite at home. Choose a Commercial license if you need DAEMON Tools in your business activities. Select Free license if you need an app for personal use. Note that it does not guarantee you a tech support and may display 3rd party offers while installing. Customize your DAEMON Tools Lite with additional features to build a personalized app that suits you the best. Pay for functionality you really need or get a full pack with an awesome discount. Built-in advanced features DAEMON Tools Lite 10 is more than just imaging software. It combines several groups of advanced features which you can purchase separately. Want to go to the next level with your DAEMON Tools Lite 10 Then choose!